Wayne Denny, U.S. Army Retired, touches one of the projects he is working on a lathe Monday afternoon in the Tennessee College of Applied Technology division at Chattanooga State. "I'll probably get a job working on machines next," Stutz said. "It'll be a better job [than I have now] and I'll get more pay." The Tennessee College of Applied Technology at Chatt State offers 20 one-year diploma programs and seven certificate programs. Below are a few examples programs, percent of graduates who are placed in a job after graduation, and average annual salary for that field. For a full list of programs, visit www.chattanoogastate.edu/tcat. "There are great opportunities here in manufacturing," Spires said. "There are manufacturers looking for people to hire right now, and [these manufacturers] are struggling to fill all the positions they have." James Barrott, director of TCAT at Chatt State, said TCAT's 27 programs are designed to help fill the city's need for skilled workers, and that 90 percent of TCAT graduates find a job related to their program. "The biggest driving force [behind TCAT] is meeting the needs of local business and industry," Barrott said. Many students, like Stutz, would not have enrolled in one of TCAT's programs without the state footing the bill for the last-dollar amount of their tuition not covered by other scholarships and federal dollars, allowing them to attend a program for free. This year, about 520 of the students enrolled in one of TCAT's programs are leveraging these scholarships offered by Gov. Bill Haslam through Tennessee Promise and Tennessee Reconnect. Both of these scholarship programs were launched this year as a way to remove financial barriers preventing people from earning degrees and entering the workforce. Tennessee Promise is for recent high school graduates, and Tennessee Reconnect is for Tennessean's over the age of 24. Barrott said he is encouraged by the enrollment bump of 7.8 percent in TCAT's programs, and he expects this trend to continue, allowing the school to produce even more graduates to fill sought-after positions in the community. And Spires said this hard work usually pays off because manufacturing jobs in Tennessee offer "good paying, very livable wages." "In this lab, students experience just what they'll do at a job," Burgess said. "This program opens doors." Burgess leaned his elbow on a wooden work table Monday, scanning the room as students took apart the circuits they had spent the day building. One of his students, Jessica Denton, said when she finishes the program next semester she'll be prepared to enter the workforce because Burgess has taught her how to fix problems on her own. "On the job, you don't have the help of a teacher," Denton said. "[Burgess] is here to help us learn how to figure it out for ourselves." Denton was previously an insulator and didn't enjoy the job. She chose to study industrial maintenance because she enjoys fixing things. In a lab hallways away, Sam O'Rear, an instructor with the machine tool technology program, said it is through this type of hands-on training that students are learning a skilled trade, and not a lost art. O'Rear stood nearby as Stutz practiced making precise cuts with a surface grinder. 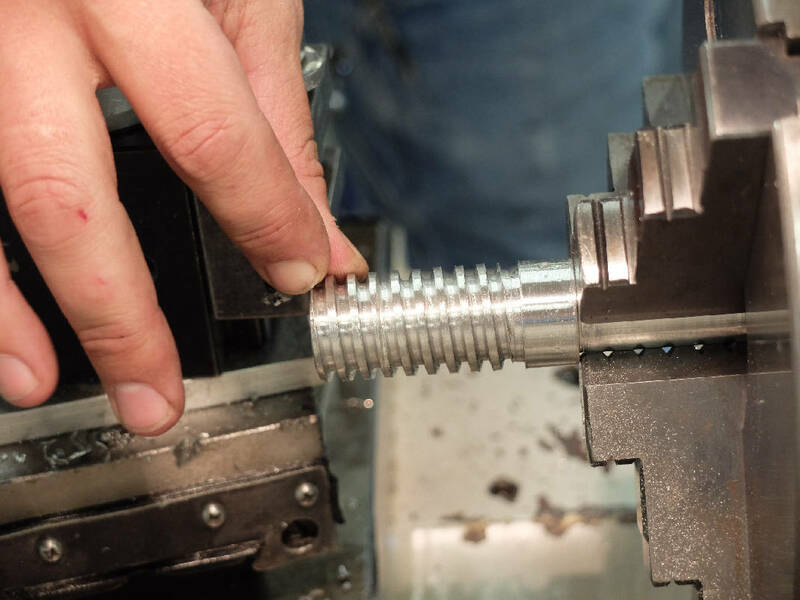 And on the other end of the lab, Wayne Denny practiced making screw threads on a lathe. "The machine does all the work, I just do the coaching," Denny said smiling. Barrott said every facet of Chatt State's TCAT programs are designed to help prepare students to directly enter the work force here and be successful. He said opportunities like Tennessee Promise and Tennessee Reconnect only broaden the opportunity to more students. "We give [students] what they need to be successful in employment," Barrott said.